This novel will have you shivering throughout, what a roller coaster ride! This novel kept me riveted from page 1 until the end. Chemical warfare has been outlawed in most countries (at least I hope it has) but do governments ever really follow the law? And what happens when a madman decides he is going to unleash it on a part of the countryside knowing there is no antidote just so he can marry the woman he thinks should have been his. The government, the Prime Minister of England realizes that this mishap must be hidden from the public and all who were alive but saw what happened must not live to tell the tale. No one but a select few know why Sarah, her children and the police officer who helped her escape are being chased--nor why Pete and his ranch hand are being threatened. Will they make it to Sarah's parents house in London? Will the truth ultimately be revealed? All I know (or admittedly am willing to tell you since you know I won't give up a story that easily) is if you ever see a bright green object in the sky and then a mist--RUN like you've never run before!! It's a peaceful night for Sarah and her family, until a strange light rises from behind the Cheviot Hills and a green mist descends across the valley. Its swirling tendrils, seeming to bear a life of their own as they snake across the land, can only be an omen of something sinister and evil. When her husband fails to return from work, she and her children set out to search for him. A terrifying discovery awaits her in the valley below her home and before long, they find themselves caught up in a desperate search not only for her husband Pete, but also for the meaning of the green light. Pursued by the military, she slowly begins to realize her life, and the lives of those she loves, are in mortal danger. The Trojan Project takes you into a nightmare world where no one is quite what they seem, and trust becomes a word with little meaning. Beware the green light in the sky; you never know what it hides! Eileen Thornton lives in Kelso in the Scottish Borders. 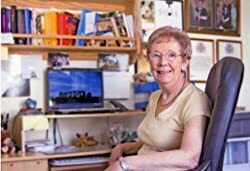 Though she only began writing in 2001, many of her short stories and article have appeared in several national magazines in the UK. But then she felt the urge to move on to writing something more gritty. Since then Eileen has concentrated on women's fiction. Divorcees.Biz, a novel of fun and romance, was published in 2012 with Only Twelve Days, a heart-warming romance, following in November 2013. She is currently working on a sequel to Divorcees.Biz, entitled: I Haven't a Clue! That sounds like a GREAT book. I love it when I get sucked in like this book would surely do to me. I hope chemical warfare has been outlawed too... but that never stops the crazy people from breaking the laws. Scary!!! That looks like a great read. The way you described it as a roller coaster ride makes me want to read it! I think this is one book that would make you stop breathing for a while when the climax is reached. Love the plot! Wow! This sounds like a great book. I loved your review! Wow, that really does sound pretty gripping! You find the best books! This sounds like a great thriller! I love fast paced novels that keep you hooked right from the beginning. So is this a book that I should not read before I want to go to sleep at night? 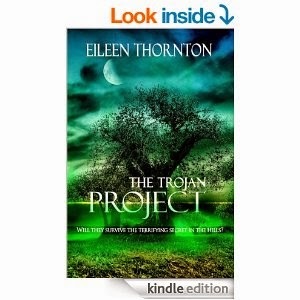 Thank you for reading The Trojan Project. I am absolutely delighted that you enjoyed it. Sounds like you really like this book. I can't picture out how exciting the story with a lot of thrilling. Sounds like a book my other half would love. I'm more a Hallmark Girl happy endings and all:) Thanks for sharing will pass this to him. This sounds intriguing. I'm in the mode right now that I need a new book to engage me. Oh that does sound like a good read! I wouldn't want to put it down! I love a book that you can't put down. Thanks for the review. It's now on my to read list. I love books that you can't seem to put down! I would stay up to the late evening to learn the outcome! This sounds so fascinating! Adding it to my to read! I love that she moved on to write something even bigger. Her accomplishments must make her very happy! I like books that are full of suspense. I think this would definitely be one for me. Sounds like a really exciting book! Seems that this book would keep me hooked from the start. Thanks for a great review! That sounds like a thrilling ride! Beach read worthy for sure! This sounds like an interesting read that would keep you on your toes. I will have to check it out. My brother would love this one too. Thanks for sharing. this looks like an awesome book. i will have to check it out a little more. I love that this novel kept you engaged from beginning to end. That is the kind of reading that I love to become immersed in these days. Sounds like a total pager turner! I need to learn more about this book as it sounds like a perfect fit for me. I think I need a "Miki recommends" shelf! Thanks for the recommendation. The government card has me super interested!